Fingertip toothbrush that is perfect for traveling. Comes individually wrapped. ﻿Case of 1000..
Freshmint .85 oz. Premium Fluoride Toothpaste $0.30 Each. This product is effective in helping to prevent or reduce tooth decay. Anti-Cavity toothpaste t..
Freshmint 0.6 Anticavity Flouride Toothpaste $0.16 Each. 0.6 oz Anti-cavity Fluoride Toothpaste with a light, fresh mint flavor. Perfect for travel, hotels, ..
Freshmint Anti-Cavity Fluoride Toothpaste: Fantastic for traveling and for everyday denta..
Freshmint 0.6 oz. Clear Gel Anticavity Toothpaste at $0.18 Each. 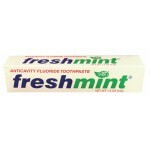 Freshmint Anticavity Fluoride Clear Gel Toothpaste helps protect against cavities. 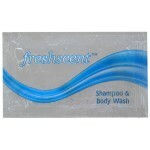 With a clea..
Freshmint 0.85 oz. Kids Toothpaste $0.35 Each. This children's toothpaste has a really delicious bubble gum flavor. 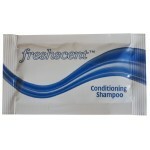 Great price as most fluoride fr..
Freshmint 4.6 oz. Toothpaste Tube $0.70 Each. Freshmint 1.5 oz Tube of Toothpaste $0.42 Each. Freshscent Toothpaste 1.5 oz. Anti-cavity Fluoride Toothpaste with a light, fresh mint fla..
Freshmint 2.75 oz. Clear Gel Toothpaste $0.49 Each. Freshmint Clear Gel Toothpaste comes in a clear tube with a screw on lid.2.75 oz.Clear gel formulaMa..
Freshmint 43 Tuft Toothbrush $0.16 Each. Freshmint 43 Tuft toothbrushWhitePolypropylene plastic6" inchesIndividually wrappedCase of 1440..
Freshmint 6.4 oz. Fluoride Toothpaste $1.19 Each. Freshscent 2 oz Baby Lotion softens, nourishes and protects the babies skin.Pleasant fragrance ..
Trial and travel size great for hotel, travel, and gym bags! Contains Aloe Vera and helps soothe dry..